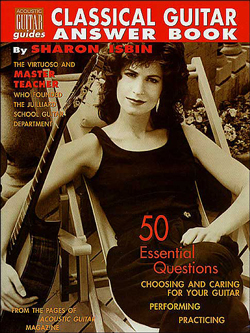 In this update of the Acoustic Guitar Answer Book, Sharon Isbin, the classical guitar virtuoso who heads the Juilliard School Guitar Department, answers 50 essential questions about performing, practicing, and choosing and caring for your guitar. The questions were asked by Acoustic Guitar magazine readers and answered by Isbin in four years of Master Class columns in the magazine. This book collects all this vital information together in an easy reference format – an absolute must for every classical guitar player. Includes new appendices of resources for classical guitarists and students.